This Fashion Embossed Flower Leather Handbag or shoulder bag is the perfect mixture of stylish elegance and functionality. It’s made of 100% durable cow leather. Embossed craft flower design, retro style; durable and fashionable. As a present for a lover, family members, or girlfriends, it will certainly be a lovely surprise and brighten her day. This bag comes with an irremovable comfortable hand strap and a removable and adjustable long shoulder strap. Elegant high-end design goes well with any outfit in any occasions like work; business, dating, daily errands, travel, or school and you will feel comfortable with this bag. came weeks about edge краснодарский parcel in very fast. looked quality leather. sister used to take. want crack open packing. high quality bag matches the description. shop recommend for shopping. handbag small. genuine leather. there are randomly косяки разбросаные picture. unpleasant price when you consider bags. can prevent like, price is 500, but no 1500. задумайся store. 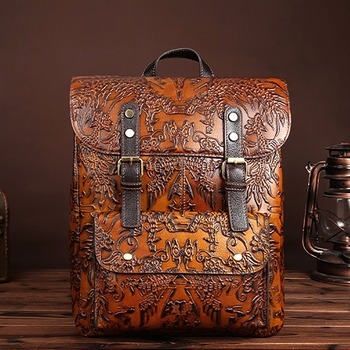 wonderful bag. unfortunately, of a pieces bag with strap has come to me different tone. not in the description of said, goes to store contact, problem resolved. bag very satisfied. all like in description. recommend.